Oooooh do I have a tasty recipe for you guys today!!! This is my ultimate meal prep comfort food. This recipe takes five minutes to throw all the ingredients in a crock-pot which leaves me time to work on other meal prep tasks. The resulting chicken dish is everything my tummy loves! 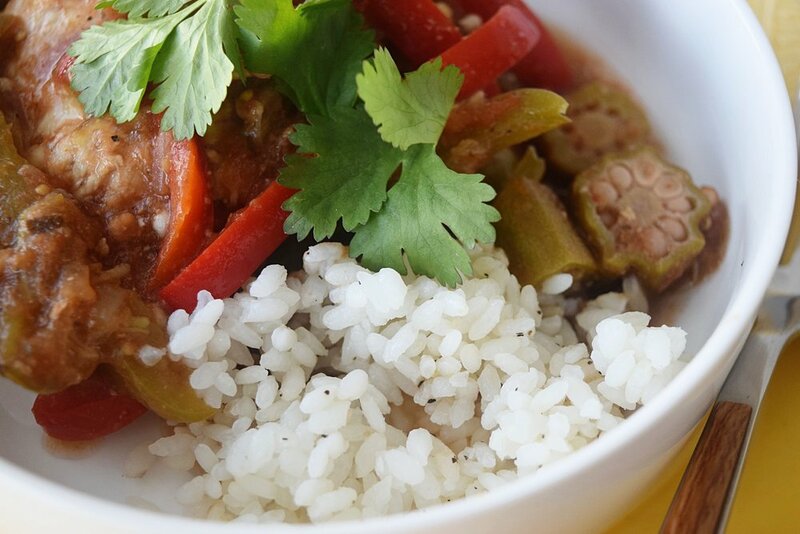 Slightly spicy, super filling and is packed with delicious veggies and my beloved okra. Have you ever cooked with okra? Sadly, okra usually gets a bad rap, but when added to this chicken dish, it creates a slightly thick sauce and adds a nice chewy texture! I serve this over rice and top it off with fresh cilantro and a splash of hot sauce! It saves beautifully in the fridge so it's a great option to divide between containers and eat as a lunch or dinner. In a Crock-Pot, add all ingredients except rice and cilantro and stir to coat chicken. Cover with lid and cook on low for 4-6 hours. Serve over rice and top with cilantro!